To thousands of tourists, it is the happy island of rum, reggae and sunshine. But a new film reveals how rich countries and the IMF keep the Caribbean poor. “The issue is to make globalisation work for all. There will be no good future for the rich if there is no prospect for a better future for the poor.” That glib, cynical statement from International Monetary Fund director Horst Köhler is brilliantly exposed for the platitude it is in Stephanie Black’s engaging documentary Life and Debt. Black’s film is incisive in its examination of how IMF and World Bank policies, determined by the G7 countries, led by the US, impact on poor developing countries. The IMF told Manley that he could get a short-term loan under their conditions but would not entertain any discussion about long-term solutions. At first the Manley government was defiant. Manley’s espousal of “democratic socialism”, his friendship with Fidel Castro and his activism in the Non-Aligned Movement did not endear him well to Washington. Jamaica’s financial crisis was further deepened by CIA destabilisation, which was exposed by dissident CIA agent Philip Agee. In the end the Manley government had to go back to the IMF cap in hand for a loan and Jamaica has been swallowing the IMF medicine ever since. Jamaica’s continuing financial crises, high unemployment, lawlessness and social turmoil have to be seen against the background of IMF/World Bank policies that governments of both the left and the right have been forced to pursue for well over two decades. 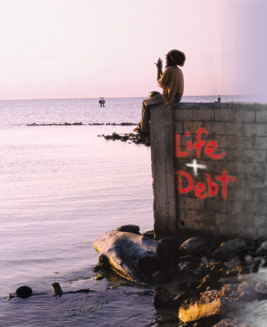 Life and Debt graphically illustrates how those policies have impacted on workers, small businesses, farmers and Jamaican society in general. We visit the local farmer whose enterprise is no longer viable because, like his neighbours, he cannot compete with the cheap imported onions and carrots from the US. Local farmers were able to make a decent living selling their produce to the local market before the IMF insisted on the removal of tariffs on imported goods. When the farmer tried to diversify to honeydew melons for export, he was told by his prospective American client that the produce did not meet their specifications. “We use machete to farm… can machete compete with machine?” asks the farmer. Who really benefited from the IMF remedy? In Life and Debt, we see Jamaica through the eyes of the tourist. We also see the Jamaica that the tourist rarely encounters: slum dwellers watch themselves on news footage of riots, political violence and industrial unrest. The Antiguan novelist Jamaica Kincaid’s essay A Small Place is aptly adopted to provide a poetic narrative. Footage of the slums of Kingston is underscored by reggae and ragga music and dub poetry, lyrical meditations on the state of the nation. “I and I want to rule I destiny,” chants Buju Banton. Anecdotes from Manley about his “bitter, traumatic” experience with the IMF, World Bank and the Inter-American Development Bank are juxtaposed with IMF deputy director Stanley Fischer’s diagnosis of and prescription for the Jamaican patient. Women working in unregulated, tariff-free sweatshops called “free zones” talk about their struggle to make ends meet on their weekly salaries of US$30. What Black’s film shows is the spectacular failure of the IMF “remedy”. After the structural adjustments, the cuts in public expenditure, the removal of tariffs on imports, the privatisations and devaluations, Jamaica is still plagued by financial crisis. Development plans have been abandoned as the vision of independence recedes. Life and Debt is a very powerful weapon in the arsenal of the global movement for a more equitable economic order. This entry was posted in ALBA, CELAC, Home, International and tagged documentary, film, IMF, Imperialism, Jamaica, Jamaica Kincaid, Jamican farmers, Life and Debt, Michael Manley, Stephanie Black, World Bank by Russell. Bookmark the permalink. what imperialism is all about. The young Jamaicans need to see it. It is they who will eventually decide which direction the Jamaica of the future will go. As it has been said ” He who forgets history tends to repeat it”. Take the heads out the sand. From my standpoint, the persistent failures of the IMF\World Bank stabilization and structural adjustment programs in Jamaica and elsewhere in the developing world in the past is something of historical record. There is no doubt about the failed global record of these two Bretton Woods institutions. The clear record of failures of these institutions is manifestly illustrated by their stated objectives in Jamaica and other developing countries. They claim the following objectives: (1)To stabilize the currencies of Jamaica and other developing countries and make them more competitive and by implication to make the exports of these countries more competitive in international markets, (2)To correct the current account deficits on the balance of payments of these countries by adjusting the relative prices of their exports (i.e make them cheaper in foreign markets) and make the imports of Jamaica and other developing countries more expensive in their domestic markets) through systemic devaluations of their currencies, (3)Thus, the IMF\World Bank economists argue in keeping with their neo-liberal thinking that exporters in Jamaica and other developing countries would invest more capital in their exporting sectors and their importers would have less incentives to import foreign goods and services. The implication being that in net, export revenues would rise and import spending would fall, resulting in the improvement of the current account deficits and presumably more jobs and growth in GDP or the economies of these countries, (4)The IMF\World Bank stand squarely for fiscal discipline which basically means that the governments of these countries should reduce spending on things like education, health care, sports, housing, subsidies for foods consumed by the poorer classes, kerosene oil and other goods and services used mainly by the poorer classes and increase taxes on them to generate surpluses on the budget and reduce deficits. The theoretical rationale for the latter on the part of these institutions is that deficit spending increases domestic demand for local goods and services and foreign goods and services which create demand for too much imports which create deficits on the current account of the balance of payments in Jamaica and other developing countries that adopt IMF\World Bank programs. Additionally, the IMF\World Bank are hawks on reducing inflation, privatization of public entities including profitable enterprises and the deregulation of international trade (i.e open trade) in Jamaica and other developing countries.These institutions also claim to reduce poverty and hunger which are consequences of underdevelopment and not the cause of it. The causes of underdevelopment are actually colonialism, neocolonialism, local oligarchy and imperialism of which the IMF\World Bank are critical tools in keeping Jamaica and other developing countries subordinated to the power of the super-rich, the big financiers on Wall Street and elsewhere in the financial world and the big foreign corporations and their local allies. (1)How competitive is the Jamaican dollar after nearly 30 years under IMF\World Bank tutelage? (2)How competitive are Jamaica’s exports in international markets today after nearly 30 years under IMF\World Bank tutelage? (3)Is Jamaica’s national budget in a better shape today? and if it is ostensibly at what cost to the poor? (4)What is the report card for Jamaica for privatization and deregulation? Do the “benefits” of these policies exceed their “costs” to Jamaicans after nearly 30 years? (5)Are there more or less poor Jamaicans after nearly 30 years of IMF\World Bank programs? (6)Can you think of one developing country in Africa, the Caribbean or Latin America that has followed the IMF\World Bank policies that has achieved growth, development and prosperity for the vast majority of its people?